In a bowl, combine 4 cups Cream Soup, salsa, tomatoes, beans, olives, cumin, and chicken. Pour sauce mixture over cooked pasta noodles and stir to mix. Divide pasta mixture evenly between two 2½" deep half pans. Spread each pan with 2 cups Cheese Sauce. Cover pans and bake at 350°F until light brown and internal temperature reaches 165°F, about 30 minutes. 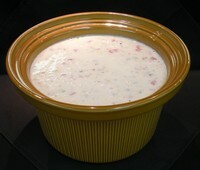 NOTE: Cream Soup Base Mix yields 1 gallon and Cheese Sauce Mix yields ½ gallon. This recipe uses 4 cups of each. Store remainder in tightly covered containers in refrigerator. Option: As an alternative, make White Chicken Chili Soup by eliminating pasta from recipe.